The other day I linked to Ben Brooks’s piece on what we should totally be calling “Bulge-gate” because that construction didn’t get tired a million years ago. As it turns out, there’s a precedent for Apple hiding the bump, because it’s been shipping a product with a camera bump for a few years (so don’t give me that “Steve Jobs never would have shipped a device with a camera bump” crap). 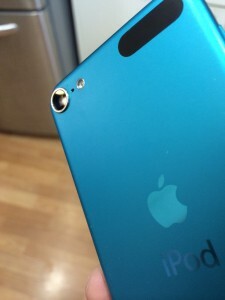 As it turns out, Apple’s product image for the iPod touch also omits the bump. Some people complained to me that it’s perspective, that the bump on the iPhone 6 doesn’t show because the camera is at the other side of the iPhone. Eh, OK, it is true (see here), but if you don’t think having that image as the sole side-view of the iPhone is somewhat disingenuous then we’ll have to agree to disagree. You may be shocked to hear that some other companies retouch product photos in order to make them look better and entice people to buy them. What has the world come to? How come no one noticed this before? Not as many people buy the iPod touch and even fewer really use it as a camera (the camera in the touch is never as good as the one in its iPhone contemporaries). So, this isn’t a new thing Apple’s doing with the iPhone 6 and, yes, this is nitpicking. But it’s not like there’s anything else horrible going on in the world to talk about.